Clock towers used to be the focal point of a village situated at a road junction or in front of a municipal building or railway station. As well as using them to tell the time of day people often chose them as a meeting place before a night out at the cinema, perhaps. There are some fine free-standing ones still around in London, plus a few on the top of some buildings and churches too. Some of them even tell the right time, even if only on one face. Theres an amazing ancient clock tower in the middle of the City of London, west end of the barbican i think, thats surrounded by huge office blocks on every side. It stands defiant in the middle of a quiet intersection. I tried to go in, but its privately owned by a big banking firm, although what they use it for i dont know. what a waste eh? I'll add it to my list and put a dot in my A-Z to check it out next time I am in that area. SOME people might meet at Starbucks or Tescos - but not me! Hello. 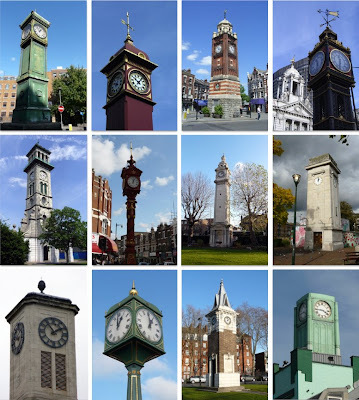 Do you know of any other similar clocks in London to the Harlesden one? My family is trying to pin down a picture of a relative from the 1920s taken in front of a shop window. The shop window has a clock tower reflected in it, with thin waist, weather vane, and lamps coming down off it from the top. My parents thought it might be Mitcham, but looking at old photos the lamps don't match (the Mitcham ones went up from below the clock faces, not down). I thought the Harlesden clock might be a candidate but the same applies. I just wondered if you were aware of any similar-style clocks in London that might be worth chasing up. The thin at the middle ones are usually Jubilee clocks, which i rather thought meant 1977 (as some of them are quite new) but due to your ref about 1920s I know think they may be victorian. I'm fond of clocks. You've given me some ideas of clocks to see. You might be interested in my write-ups on the Angel Clock. The latest is here. Silvertiger; wow! that's so in-depth and well-written. Thanks. I have added it as a link to the caption.